Wales is the only nation that has a devolved government guide for taking a whole school approach to gender-based and sexual harassment, backed by law. But Wales has gone further than this. It has produced a national resource kit that takes forward a core part of a whole-school approach to healthy relationships – supporting young people to take action themselves. AGENDA: A young people’s guide to making positive relationships matter is a free online guide developed with young people, for young people. It has been designed so that 11-18 year olds can explore the issues they are interested in at their own pace. 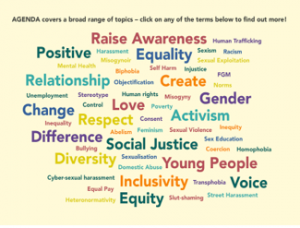 It showcases the different ways in which young people in Wales and across the world have raised awareness of a wide range of issues, including: gender equalities and discrimination, consent, LGBQ & T+ rights, bullying and sexual harassment, street harassment, female genital mutilation, sexual exploitation and relationship abuse. 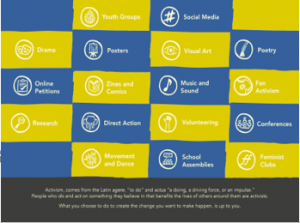 case study examples of how young people in Wales have raised awareness of different topics. the story behind AGENDA, who has supported the guide, and how it can be used. With equality, diversity, children’s rights and social justice at its heart, AGENDA enables young people to speak out on gender and sexual injustices through their own and others’ change-making practices. It’s an affirmative and creative approach to learn about and change deeply entrenched and complex issues. 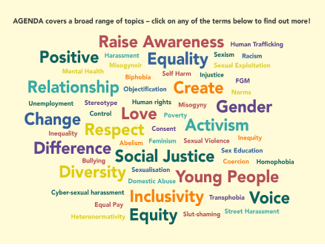 After familiarising yourself with AGENDA (go to www.agenda.wales to download or read online), click the links below to see the range of ways it can be used as a teaching and learning resource.